A collaborative project between Philippa Wood and Angie Butler of ABPress. Fond Farewells is a pair of limited edition artists' books which form part of an on-going project called Endangered Species, this particular edition examines lost language. 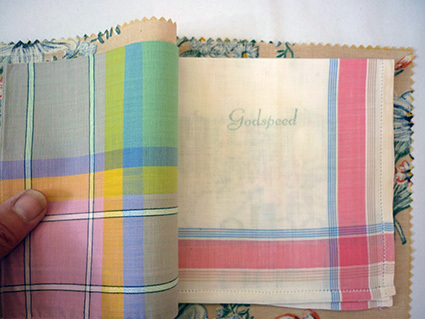 The two books - His Fond Farewells and Her Fond Farewells are letterpress printed onto men's and ladies' handkerchiefs. The books are machine-stitch bound with material covers to reflect the nature of the contents. This artefact will be exhibited at Minnesota Centre for Book Arts, USA - within the exhibition – Reader’s Art: Control/Alt/Shift. 9 June-13 August 2017. This event is part of the Book Art Biennial 2017. Fond Farewells has been purchased by University for the Creative Arts for their Library Collection (May 2017) Fond Farewells has been purchased by UWE, Bristol for Special Collections at Bower Ashton Library.